Yenaduak Homestay is located in a quiet, coral rich bay on the northern coast of Birie Island, which lies off the north coast of Batanta. Five VIP bungalows with ensuite bathrooms are available at Yenaduak. Both bungalows have indoor bathrooms and verandahs with sea views, a table and chairs. Bedding is mattresses on the floor, and includes sheets, pillows, bolsters and mosquito nets. Bedrooms are equipped with room light switches and power outlets. Extra mattresses are available if more than 2 guests will sleep in a bungalow. Meals are served in a sand floored beachside dining shelter and free tea, coffee and drinking water are always available there. Electricity for lighting and charging devices is supplied by generator and is available from sunset to around midnight. Mobile phone reception is variable. SMS and phone calls are possible and a slow Edge (E) data connection can sometimes be made. English is spoken at Yenaduak Homestay. Transfers from Waisai to Yenaduak Homestay cost IDR 1,300,000 each way. Transfers are by longboat capable of carrying up to four passengers and trip cost is shared by passengers. Transfers direct to/from Sorong are also available (max 4 passengers) and cost IDR 2,500,000 each way. 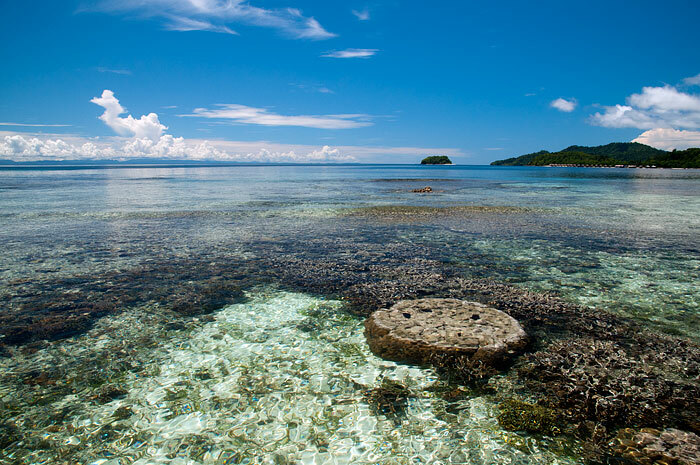 Yenaduak Homestay is quiet, remote and isolated and has spectacular healthy coral at the doorstep. 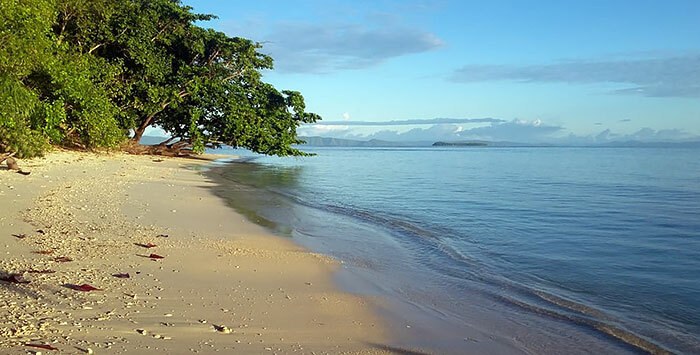 It’s a perfect getaway for lovers of tropical islands, beaches and coral reefs. 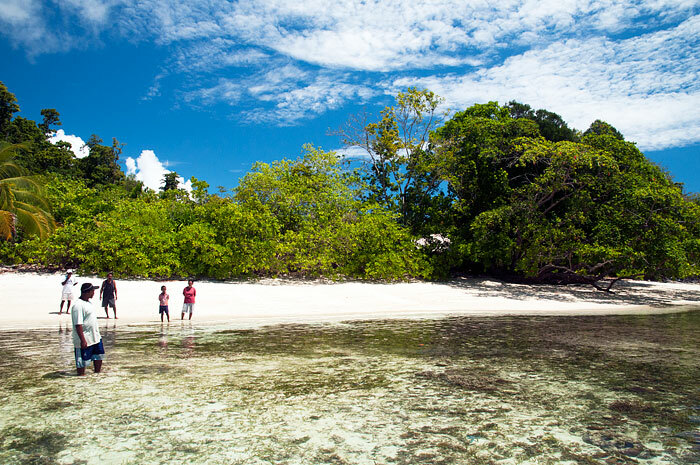 The main activities available are snorkelling (bring your own gear), hiking and simply relaxing and taking in the blue panoramas extending across the strait to Waigeo. Blacktip reef sharks and dolphins are common sights in the waters at Yenaduak and dugongs can sometimes be seen at high tide. Turtles often nest on Birie Island’s beaches and bioluminescent plankton sparkle in the homestay’s waters at night. 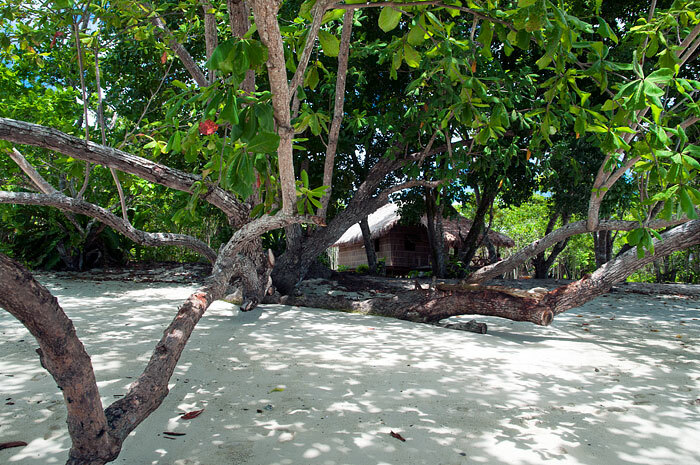 At low tide long beach walks become possible and Birie Island’s jungles are home to a huge variety of fauna and there are trails by which it can be explored. The spectacular Wilson’s Bird of Paradise can be observed nearby on Batanta. 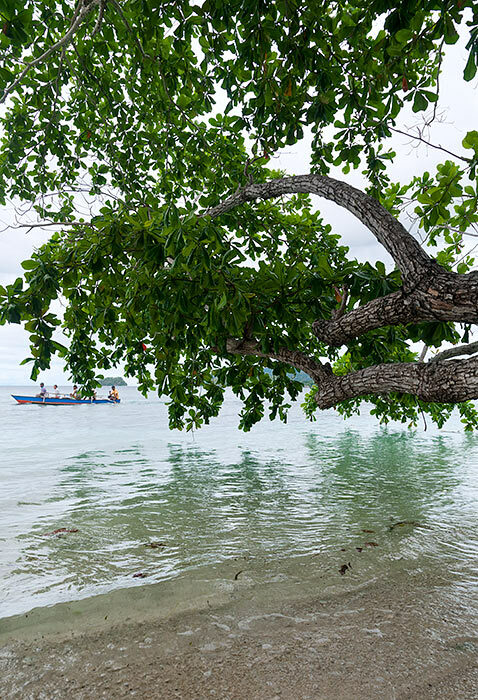 Boat trips to explore the many islands and bays of Batanta’s north coast can also be organised and the pretty nearby village of Arefi is also well worth visiting. A selection of the many possible trips is provided below. Prices are per trip in IDR and are shared by trip passengers. Trips for larger groups can be organised, but will require a larger boat and will be more expensive. The bungalows in Yenaduak are large and comfortable, with ensuite bathroom and western toilet, hammocks are provided and the area is clean and well kept. All meals are provided in as well as snacks in the afternoon in the spacious dining room and table. Sam does its best to satisfy any request from the guests and there are several excursions one can chose. Eventually I can say that is a perfect place to relax, snorkelling and enjoy your time. We stayed in 6 different homestays in RA in february and the bungalow at Yenaduak was the nicest, we had. Very big with a comfortable bed and ensuite bathroom . The deep jungle starts right behind the Homestay and you will hear the jungle sound every night. We saw an endemic flying snake and many lizards there. The food was good, always enough, often fish or chicken and something sweet in the afternoon. Good milk coffee. The reef is beautiful. We saw sharks, a big yellow trumpet fish, a Seacrait and many other fishes. Unfortunately not the Dugong, hopefully next time. Our trip to the Mantas was fantastic. We saw several Mantas, snorkeling there for hours. Sam’s sun helped us to find the them. We had our lunch at the beach there, which was very nice . Sam is a sympatic guy, he drove us to Waisai, after we found out in Arefi that the ferry to Sorong won’t go. In the last minute we reached the ferry. Sam and his son running with our luggage to get it. 🙏. This is the BEST homestay in Raja Ampat. Okay, to be honest, we’re a little biased because it was the first and last homestay we visited – everything was just too nice and we couldn’t leave! We (a couple) stayed for two weeks in March and would could have easily stayed for another month if we had the time. One of the other guests we met (solo traveler) stayed for more than a month – people just don’t want to leave. Sam and his family are incredibly nice and welcoming, the food is great and with more variety than we expected (breakfast is typical but tasty). We took a few various trips with Sam and crew. All were totally worth every penny and more. For the Batana waterfall trip, done after a few days of evening rains, Sam and his cousin spent the entire hike running back and forth between the members of the group, encouraging everyone and lending a hand (or physically hauling them up) as needed. In every step of the way, on every trip, Sam is not just standing back (as we heard other guests talk about), he was always in the water with us looking for various kinds of underwater wildlife and making sure everyone was both safe and happy. Sam speaks the best English of his family on-site (his brother also speaks English and works at a resort nearby), but people should remember English is his third language. Communication issues happen, it’s normal, but with some patience and a smile we had no difficulties. For any homestay, it seemed to work best to have a local Indonesian/Papuan contact the numbers listed here and organize our meeting with Sam. Also, the info listed here is slightly out of date. There are currently 4 bungalows (all en-suite), not 2. And 2 are *supposed* to be constructed in the coming weeks so there may be 6 soon. 1 bungalow we saw was huge, new and gorgeous. Other three seemed to be similar sizes (still much larger than other bungalows other guests told us). Ours was great, no complaints about mold or anything. The 3rd we saw was similar and seemed fine as well. The 4th we only saw from outside, but didn’t seem different (though we didn’t go in). Coral just outside homestay is GREAT. And going in either direction GREAT GREAT. Tons of color, tons of variety, tons of fish. Saw sharks and stingrays almost every time in the water, saw a few turtles, there are mantas and dugong but didn’t personally see. Saw HUGE manta at nearby manta point with Sam. Saw dolphins numerous times with Sam on trips. You can get internet sometimes or you can climb up a nearby path (5-10min from homestay) and it works well. We had an amazing time and couldn’t ask for anything more. There just seemed to be no good reason to leave and try another homestay when everyone who came told us this was the best one they visited! The family is really, really nice and it felt like they welcomed us with open arms. We miss you guys!!!!!!! While seeing the Wilson’s Bird of Paradise and swimming with the manta’s were beyond awesome, trusting Sam is entirely another story, especially if you are a solo traveller. My Yenaduak experience was the only time that I felt my safety and security were at risk while travelling for three weeks solo in RA. Essentially, upon arrival, after confirming with Sam the day before, I was told “full” with no explanation, no English, nothing, including no signal. I ended up “squatting” in an unused, moldy bungalow. When Sam actually appeared two days later, he admitted that he gave my reservation to a couple so that he could make more money. The accomodations listed on this page misrepresent what is available at the homestay and Sam is playing games with reservations in order to hold out for double occupancy. Travellers should know that there are actually two older bungalows that are no longer listed because they do not have the features of the new ones. They are not completely awful, though the one I had to grab was full of mold and is not even offered even as overflow. Period. I want to add that he had 3 reservations made in November (2 solo and 1 couple), for 2 listed bungalows and then accepted another reservation from a couple made a few weeks earlier. He put the male solo traveller who had reserved in November in one of the older bungalows and saved the newer, nicer bungalows for couples. I made my reservation with Stayrajaampat, I confirmed with the owner the day before and yet, I was left in an unconsconiable position. I hope Sam does not do this to other travellers. Thanks for taking the time to post your feedback Ellen, and we are so sorry to hear that this happened to you. Such practices are unprofessional and completely unacceptable. The Homestay Association is currently working toward implementing sanctions for homestays that do not maintain professional standards. Those standards obviously include honouring bookings made through the Association’s website and providing up to date and true representations of accommodation offered. Homestays failing to do this will be removed from the website. Thanks again for providing the feedback that lets us know that Yenaduak needs attention in this regard. We encourage all guests who experience booking failures like this to make sure that we are aware of it, either by commenting on the appropriate homestay page as Ellen has done, or privately via our contact page. 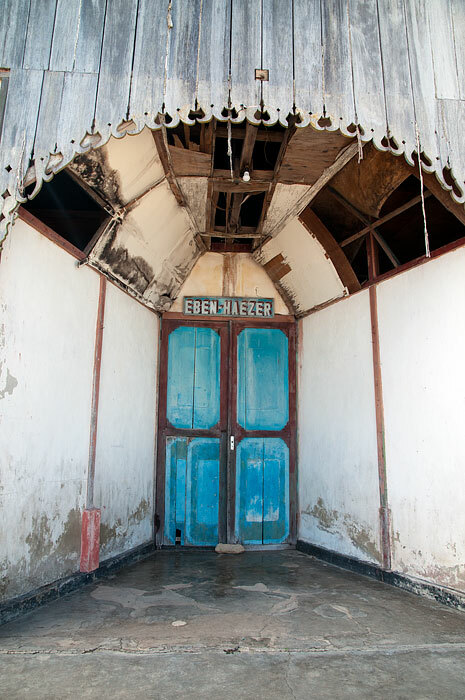 We (couple, 30 years, experienced divers), spent 4 nights in December 2018 at the Yenaduak Homestay and absolutely loved it! + Sam and his family are super friendly and will help you wherever they can. Because of the huge delay of the public ferry (more than 12 hours), Sam even brought us to Sorong by himself for a very fair price. + The bungalows are super spacious with an ensuite bathroom, a proper bed and an big terrace. + The food was good and we had always enough (they also served a snack in the afternoon). + The reef in front of the homestay is beautiful with plenty of reef fish, healthy corals and good chances to see some bigger animals as well. A couple of times we saw turtles and almost every time we went snorkeling, we saw reef sharks. Another guest even saw a dugong during our stay, unfortunately we weren’t that lucky. + It feels like a real homestay and you’ll probably meet a lot of the family members. But you need to speak some Indonesian if you want to communicate with them. Sam’s English is good enough to speak about the things you need to know. This place was amazing! Felt like 5 star luxury with the en suite bathroom. The coral in the surrounding area is in really good shape, but the highlight of our trip was for sure going to see the mantas. It was so good we went 2 days in a row. We didn’t see any dugongs but most of the other guests got a quick glimpse of them whilst out snorkelling. From all the reports it seems the best chance to see them is just to go out and have fun snorkelling and hope to catch them as they make their way from the grassy areas back to the deep blue. The food is great, Sam was happy to help with whatever we wanted to do and was always around to ask about anything. Hi John, Glad you had a good time! We really loved our 5 days here in paridise 24th Dec to 29th Dec it was so peaceful in beautiful lush surroundings with abundant varieties of soft & hard coral & fish everywhere.We did snorkelling trips & bird of paridise tour which were amazing. We spent 3 weeks in Raja Ampat on 6 different islands this was our last and by far the best homestay we stayed at, the room was huge with a proper bed, mozzie net with no holes and ensuite bath with plenty of fresh ground water under big shade trees. Yes the water is brackish but that happens with ground water there is absolutely nothing wrong with it, it soaps up beautiful. There was a good variety of food over the 5 days & we did not go hungry. They currently have 3 ensuite bungalows, the 4th bungalow is almost completed, then Dad and the boys will start on the 5th bungalow which now only has the roof & floor completed. It was lovely to see the family all working together in harmony something we don’t see much of elsewhere in the western world, keep up the good work everyone your doing a great job & don’t work Dad to hard, he needs to rest or he will sieze up. Take good care of yourselves, We will see you all in 12 mths time when we return. Do not look any further than here if your going to Batanta, you will not be disappointed with Yanaduak. I forgot to mention that there were no bed bugs or rats here, our milk powder was safe. I recommend wearing a full skin suit to prevent sunburn and sea lice stings. This is such a great place to stay! Sam and his brother Wahey were so welcoming and looked after our every needs. In fact, the whole family was lovely. We went to see the waterfall and it was amazing! We also visited the nearby village, which is authentic and quaint. The housereef was fantastic, it stretches out across and is huge. This was the place where we have seen most fish, some we have never seen before. Some corals are damaged, but that’s due to the tides and strong currents at times. Food was the best at this homestay, and we even got chicken a few times, which is not guaranteed in Raja Ampat. You will feel like you are the only people in the world when you stay here and you can enjoy the peace and quiet. The rooms were huge compared to our other homestays and we even had proper beds and our own ensuite bathroom. Overall, we can highly recommend this place. 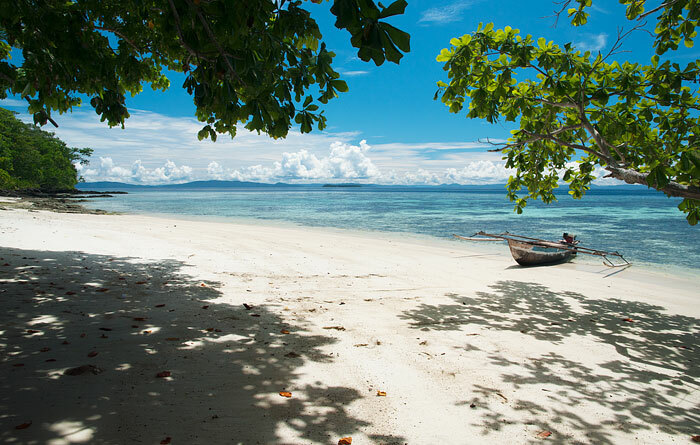 It’s perfect for snorkeling, you get a pristine beach and stunning view and comfortable rooms and plenty of food. We had a pretty perfect stay. There are only two huts. At the time (29.dec-02.jan) we were the only guests. Pretty romantic. The huts are fairly new and very clean. The beach is perfect and the corals pretty nice. The house reef is huge. Saw a wobbegong there. Only minor minus: the water is a bit brownish, but seems to be clean. We are both healthy, so doesnt seem to be a problem :). The beach has sun only until about midday, so get your sunburn early im the day :) the food was also good (first we had veg + egg + fruits, then fish). The snacks are very nice. Particularly the cinnanon buns. Bring alkohol/beers, since you won’t get any there. Sam and his boys (brother/cousin) took very good care of us and are super-nice. Particularly his brother W**** (sorry couldnt remember the full name). We did two excursions (snorkeling + waterfall). Particularly the waterfall is not to be missed. Super-nice!! Sam has a good eco-thinking and we both did collect as much floating plastic as we good and he even said “thank you what you do is goid for raja ampat”. I was also pretty impressed by the villages. Hardly any plastic lying around and arefi even has a solar power plant! Well done guys and good to see that the tourism money is well invested. Hope to come back soon and all the best for you guys! -We did NOT encounter bedbugs. So the problem seems solved. We were in the second hut from the left. -There were NO sandflies. All easy. -I just recently read about the sun-screen issue. If you are planning your trip maybe check for dunscreens that are reef safe. Nice homestay, good food, nice bungalow, reef unfortounatly partly destroyed but plenty of coral fish in high variety. I stayed here 4 days in December 2018. It’s great quiet place to stay. One of the best homestays where I was. The bungalow is big and clean, with bathroom and toilet. The bed is wide and comfortable, large mosquito net. This is the only furniture inside. On the terrace is the table, a plastic chair and ,most importantly, hammock). The view on the ocean from the terrace is stunning. I could watch this for hours. Just in front of house you can snorkel on beautiful reef with the best corals I have seen in my visit to Raja Ampat. The reef is long enough to explore for 2-3 days. Here you can see many different fishes and enough large sharks. If you are lucky, not like me :(, you will can to see a dugong. Food is simply, but plenty. Mainly tofu, chicken, eggs, rice. For breakfast various homemade baked goods, donuts and bananas and so on. Electricity was only after 6pm. and until 11 or 12 pm But this was enough to charge the phones. The mobile internet signal was very rare and weak, but I had the ability to send emails and messages. Sam and his family are great hosts. Many thanks to them for hospitality. I am very glad that I had opportunity to spend 4 days in this homestay. If you need to relax I highly recommend for visit this place. Great accommodation in paradise, great people. We stayed three nights end of September, and we enjoyed every minute of our stay. The negative aspects of this small Homestay are easy to list: none! The positive aspects are nearly endless: the family is amazing, they take so much care that you are feeling well. The location could not be better: snorkeling directly from the beach is phantastic. The food is great: although the ingredients are limited, they make so much out of it. And definitely no need to bring some food there: you get much more than you can eat. The private bungalow is cozy with some nice features: a comfortable bet, clean bedsheets, a good mosquito net, even anti-mosquito spray (Stoffel) is provided. Right now they have two bungalows with private bath, but they are building more. We can only recommend this place in paradise. Great Homestay. Stayed five nights in March 2017. I wanted peace and solitude and I got it; I was the only guest. 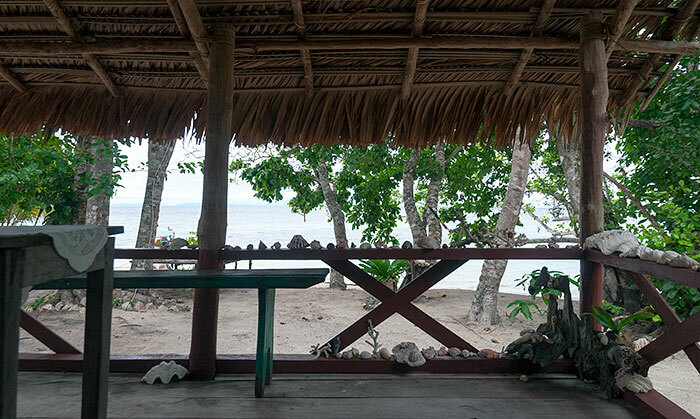 Quiet, beautifully thatched cabin on the beach with a great home reef right in front. I counted 50 species of fish in the first hour (I timed it) on my first day in the water. Countless spectacular corals and other marine invertebrates including giant clams with iridescent neon blue edges. No need for costly, time-consuming, additional boat rides to reach world-class snorkeling; just walk into the water here. This is a safe place for solo snorkeling. Because it is inside a large bay there is almost no current. This increased my safety since I was in the water alone every day. (It is on the same bay as the Eco-Resort, which you can see, but Yenaduak is more affordable.) Day trips to other locales are available if you want them. The owner, Sam, and his nephew took me on a 40-minute boat trip one day, including up a jungle river, to a nice 2 km waterfall hike. He took me to see dugongs on the way back. We also saw manta rays breaching (now that’s a wow) and flying fish and numerous dolphins, including a pod of 12 breaching endlessly, on the boat crossing from Waigeo to Birie Island. Sam’s 36-foot wooden longboat (a dugout canoe with a powerful outboard engine) is a special boat to experience on the hour-long crossing to Birie from Waigeo Island. You are not likely to ride in a handmade wooden boat of this size many places in the world. Food was plentiful, nutritious, and simple. Tofu dishes were good. My only criticism of my entire stay is that I would have preferred locally caught fresh fish to the dried-out fish that was served with red sauce that was too sweet. I also did not care to have doughnuts for breakfast most days. Less sugar would be better. The salak (local fruit that you peel yourself) were delicious. There were also bananas for snacking, unlimited filtered water for drinking, tea and coffee 24/7, a simple indoor shower and toilet, and electric light in the cabins and on my porch from 6:30 p.m. to past midnight. I read a 950-page novel, The Goldfinch, sitting on the porch overlooking the ocean day and night when I wasn’t snorkeling or hiking. Yenaduak Homestay is remote and worth the time to get there. No noise except the birds. I was awakened by the most wondrous bird call every morning and went to sleep to the cacaphonous sound of thousands of birds calling in the wetland behind the homestay each night. Sam and his very friendly family worked hard to accommodate and make my stay comfortable. Except for the too-sweet red sauce, dried fish instead of freshly caught, and doughnuts for breakfast, I would rate Yenaduak a 5-star. I would stay there again. Sam and family are typically friendly, helpful hosts. Took us to see cendrawasih bird of p. about an hour away by boat. Good stuff. He’ll take u where u want. Snorkeling off the beach is good. Plenty to explore. Get the early ferry. Nice and quiet. Home stays springing up around. We have been with Sam’s family for 5 days. They are very friendly and looking forward to make your stay to be the best. The house reef is stunning, best snorkeling we ever did. The cottage is very simple. The family is cleaning every day all beach and small roads. Don’t expect fruit or fish in European style. Mostly will receive eggs, vegetables and rise. There is plenty of food and the best part are donuts made for afternoon! Really 5 stars. There is elettricity only for 5 hours after 6pm. Please take note that also water for showering is electricity powered so if you will use very small amount of water to shower in the morning you want be able to shower later after snorkeling. But as I said all this is well compensated from variety of fish just in front of your house. We stayed 11days here in 2017 and could have stayed longer. Everything was fantastic, the bungalow, the beach, the food, and the stunning house reef, which was perhaps the best we have seen. Sam and his family did all they could to make our stay enjoyable. Sam is very environmentally conscious, he cares and understands the importance of taking care of the reef and he is the only Homestay owner we have seen who brings the plastic garbage to Waisai. Thank you njo nabor Sami dan untung untung. Kita suka sekali tinggal Homestay anda. Sampai jumpa. Great alternative to the hordes on Kri. Quiet, scenic and remote. Well worth the extra travel distance (about 1.5 to 2h from Waisai). We spent three days (recommend longer) in early February sharing with just one other couple. It’s also the only homestay we found with an en suite bathroom. Situated in front of a long beach with beautiful coral and drop-off. We saw turtles, black tips, a walking shark – worth a night snorkel. Sami was an excellent host. Took us to Wai Island to snorkel with Giant Mantas, looking out for us in the strong currents, to Arefi village and to Arun island reef. Excellent day trips. 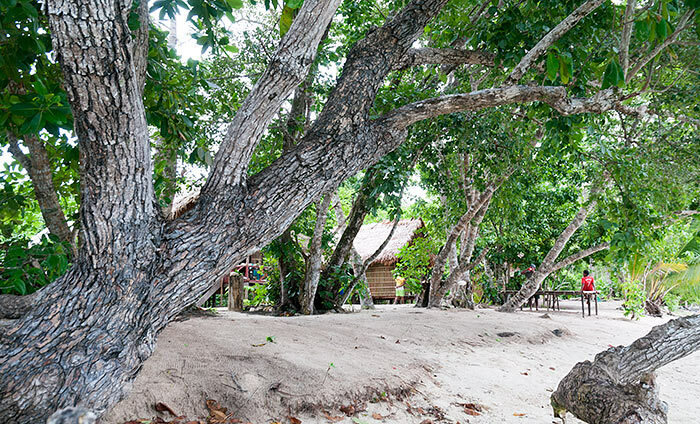 Probably the best of the homestay on Birie Island. No phone reception so give Sami time (a couple of days) to respond. It’s great, isn’t Paul? Thanks for taking the time to leave a review :) Just a note for others reading your comments: There are several homestays that have bungalows with ensuite bathrooms. You can easily find them by using the advanced search on the accommodation page. Just select “Has ensuite bathroom/toilet” (plus any other features that are important to you) and hit the blue “search accommodation” button to see a list of matching homestays. 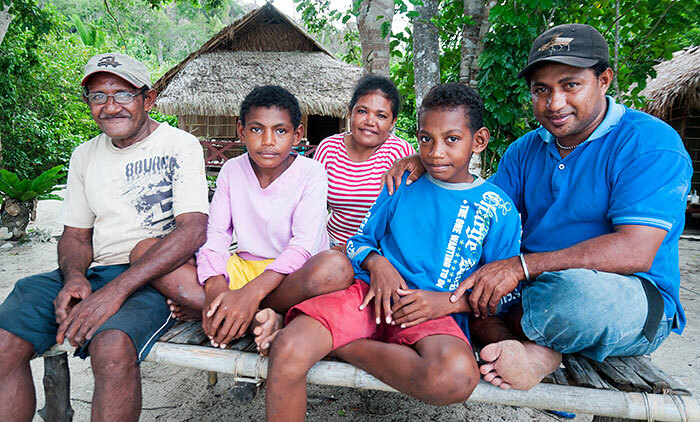 We have just returned home from Raja Ampat during which we spent 5 nights at Yenaduak Family Homestay. We had a lovely time, despite some rainy days making it difficult to venture out. As it was, we enjoyed exploring the excellent home reef which is extensive if you follow drop the off in either direction. Leisurely walks along the beach and relaxing in this most laid back of places were also not a problem for us – for the most part, we had the beach to ourselves which made it particularly relaxing. Sam and his family are excellent hosts and took good care of us, providing us with great, mostly vegetarian food and comfortable accommodation. 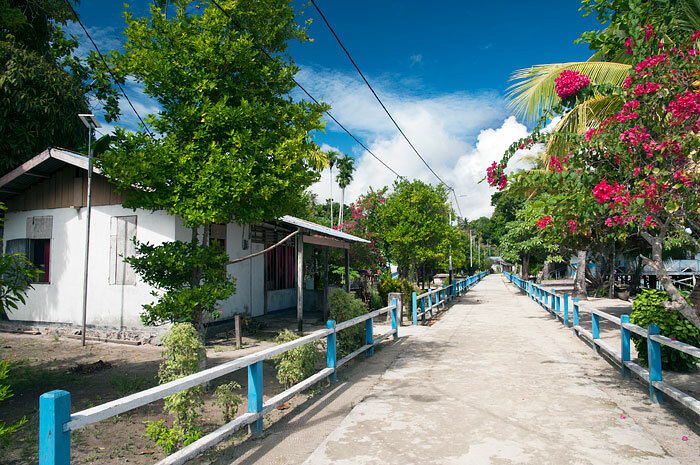 There are plenty of side trips to do around the homestay if the weather is good – we went to Urun reef and Arefi village which are very worthwhile. At the end of our stay, when the weather was very windy, Sam ensured we got safely to Manyaifun. We also were treated to a wonderful and unforgettable musical evening courtesy of Sam and his friends. We highly recommend this place and are already planning a return trip! To start with: the bungalow is very spacious and you have a bathroom for yourself. The bed is great, but the mosquito net is not so great, so if you prefer a great one you should bring one yourself. Keep in mind that the first telephone signal is more than an hour by boat away, so when you book you will be in touch with someone based somewhere else. Because this person can not always reach Sam, it could be possible that when you arrive they did not expect you. But they will have a room for you and this will be ready within half an hour with water, a table, chairs, everything :) They even clean the room during your stay. The snorkelling in front of the homestays is one of the best snorkelling experiences you can get in Raja Ampat. The coral is wonderfull and there are so many fishes!! We did not spot a Dugong, but I think when you ask around a lot about where to look for them you have a better change seeing one. Maybe we were just unlucky. They said they are in front of the homestay sometimes. For snorkelling the water needs to be high. When te water is low you can take a walk to the right and to the left. When you go to the right (your nose is to the sea) you can have a long beach walk. It leads to the inside of Birie Island, where the water meats the most central part of the island (I hope you understand..). From there you can take a small walk into the forest, but watch out since at some point the path changes into slough. You can spot a lot of special birds from here. When you take the walk to the left you will have to challenge some rocks. Be sure to wear footwear because you will end up bleeding without! You can walk pretty far, almost untill Krishna Homestay and you will find a lot of nice views. Ask them to bring you to Arefi village. It is a very nice and beautiful village. They take good care of their dogs. There are several small shops there. 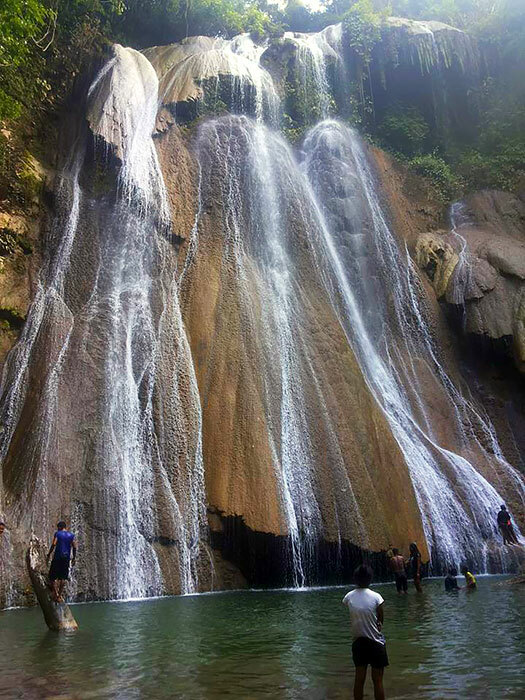 Sam can also arrange other tours, like Batanta Waterfall or Wilsons bird of paradise. There is so much to do here! I really recommend you to stay here for a couple of days. 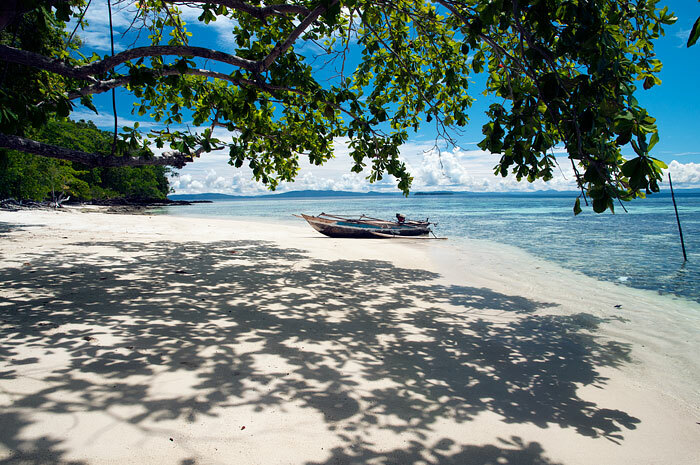 Birie Island and Batanta are Islands you should not miss. It is so quiet. There is almost nothing there. Just an island, wonderfull birds, wonderfull sealife, wonderfull views and a few wonderfull people. Thank you so much Sam and family for the time at your Homestay, I am sorry it took us so long to write something! Sam and boys were amazing and fearless jungle guides to see birds of paradise, and his sister cooked delicious, healthy vegetarian food for us. We saw dugongs, loads of black tips, a sleeping bamboo shark, unicorn fish, groupers, puffers, boxies, and so so so many more. It was the healthiest coral I’ve seen, and I hope it stays that way and doesn’t become what Krie is…Keep it clean and bring out all the trash you bring in, like camping. Don’t use sunscreen. This coral is precious and so beautiful. Bring your own snorkel gear, and prepare to spend hours and hours in the water, so bring freediving suits or make up your own (I used jogging clothes to protect myself from the sun). Find a way to protect yourself from mosquitos without using Deet or damaging chems that will hurt the coral when you go in. Bring the cash payment in hand because there is no wire transfer. For reef searching, this was our most memorable reef vacation. We stayed here in March 2016. Great place to relax. Sammy and family were the best. Food was super, snorkelling impressive. Much less crowded than Kri and Gam and really worth the trip. Highly recommend a visit. Sam was a wonderful host and took care of us nicely. The place looks like a paradise, located in a remote island, it was just about us, the sea, the birds and the marine life. Every morning, when we woke up, we went directly snorkeling in front of the home stay and it was a wonderful way to start the day. The coral around the island is very healthy, rich and colorful. While snorkeling, we managed to see sharks, turtles, bump heads, eels, squids, and one time we saw dolphins and dugong. As an experienced divers, I can say that some snorkeling I did in Batanta were better than the diving in other areas. I definitely recommend Yaneduak homestay for the people who wants to take some time to connect with the nature, with themselves, with each other and feel like in paradise. Talking about diving…is it possible to go diving from there too? It’s very basic, of course, but the sheer relaxation offered is worth it. There is no cell phone coverage, obviously no WiF, just you, the beach, and the water. The beach hut sleeps two couples (or four individuals, albeit two per mattress), and there is a nice terrace to spend evenings on. 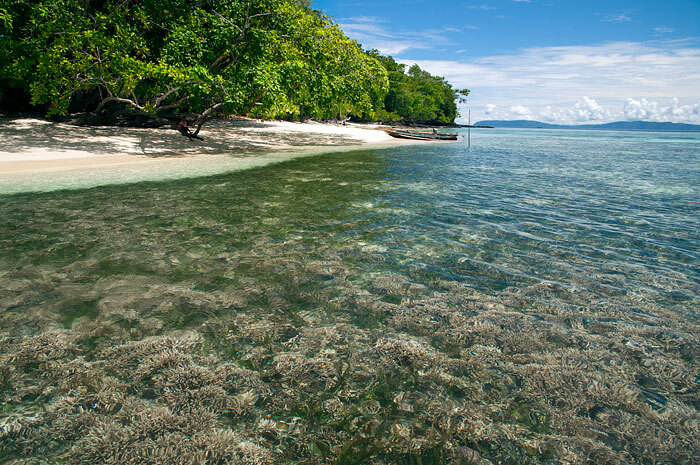 Snorkeling is up to you, and you’ll need to understand the tides to avoid getting trapped by the corals. It’s a beautiful place to escape the world. Thanks for the news Romain – they must have changed their policy since Isabelle’s news below. 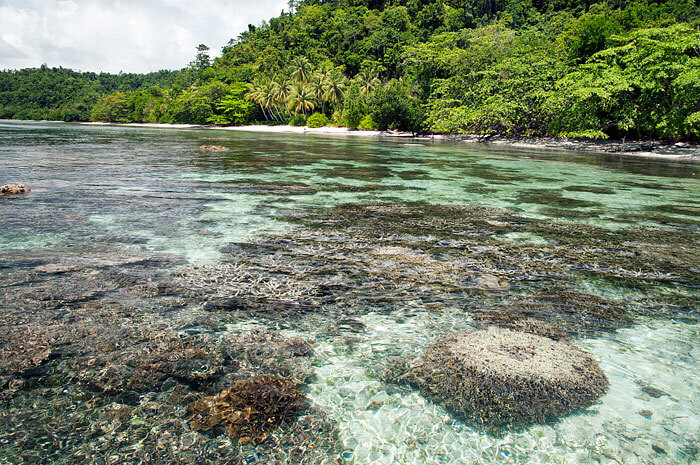 It’s no surprise really – many resorts resent the entry of local community operators into the accommodation and diving business in Raja Ampat and regard them as the enemy. We’ll be sure to post about it as soon as we hear of a homestay dive centre opening near Birie. We had a wonderful time at the Yanaduak homestay, which was a fantastic place to wind down and relax. The remoteness meant that we had the entire beach almost entirely to ourselves (with the exception of the wildlife!) for swimming, snorkeling, and walks on the beach. Sammy, who runs the homestay, and Ronne, who lives in Sorong, were both very helpful and made every effort to make sure that we felt welcome. On our first day, Sammy set up a hammock in front of the beach which was my favorite spot to read, relax, or take a nap. 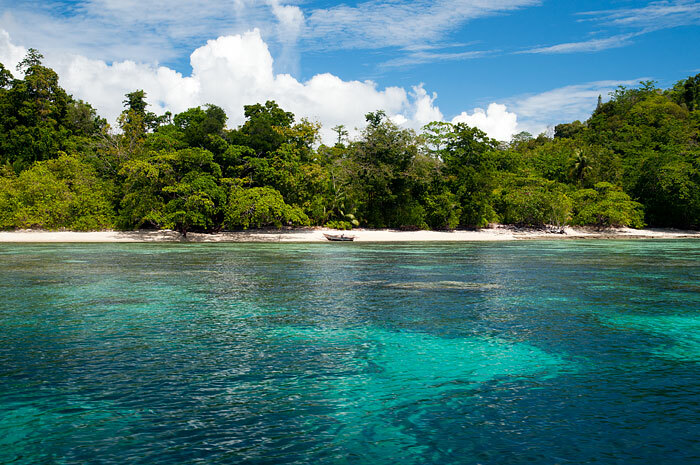 We were also able to arrange a full day of diving with the Papua Paradise Resort, which was incredible, as was the snorkeling right in front of the homestay. Overall, I would definitely recommend the Yanaduak homestay! I stayed i October 15 here. The house is a bit dark. There are 2 small bedrooms inside now, instead of the one big room. Fod was ok and plenty. there were many sandflies. Use moskito repellent. It helps also against them. The reef and the variety of fish is amazing. I saw a big school of about 25 bumpheads, 2 dugongs, big blacktip sharks and many others. I was in 12 different places. for the snorkeling this was one of the best. 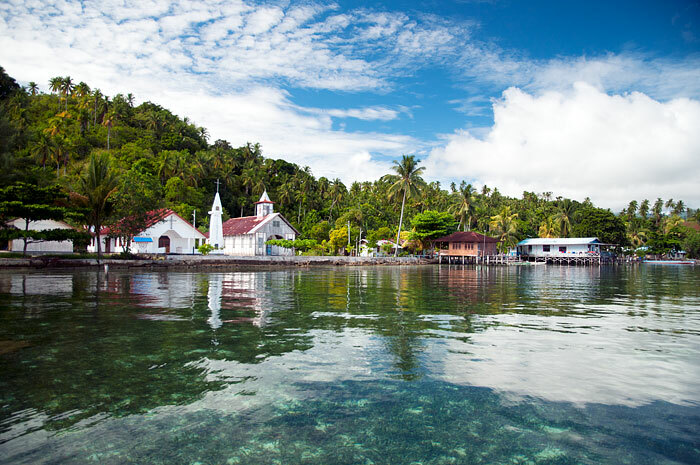 I will be traveling to Raja Ampat in December 2015 and I’m planning to stay at several homestays to cover many areas. I’m very much interested in Yenaduak Family homestay since it seems Batanta offers very isolated, untouched coral reef and nature. I would like to ask if I can expect the house reef around Yenaduak to be more abundant and packed in comparison to Kri or Gam island? Since Batanta is a long way from Waisai in comparison to others, I would like to at least be sure it has something to offer specific to such location. The reef all along the north shore of Birie is every bit as spectacular as Gam or Kri. See the photos in the gallery above and on Yenkarom Homestay’s page. We haven’t dived or snorkelled it though, so we can’t swear other marine life is as abundant there. There’s certainly no reason it wouldn’t be. One of the best things about Yenaduak is that it’s a single private bungalow in an idyllic location. 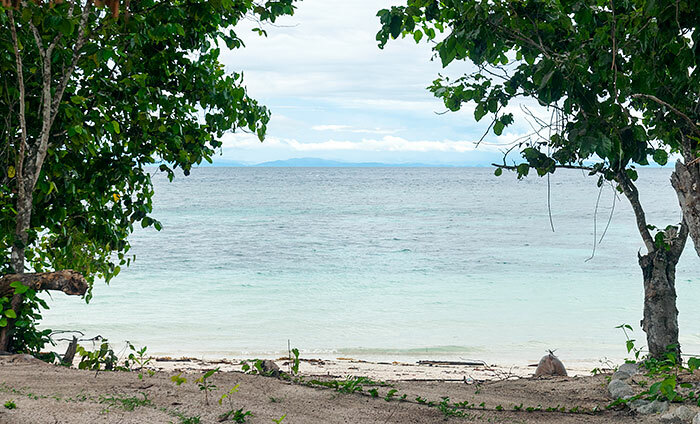 If untouched coral reef and nature are what you’re looking for, we’d also recommend you visit Korbekwan Homestay on Gam. I can answer your question. The diving and snorkelling around Kri is the best, yes the best that exists anywhere. Only matched by other euqally good places throughout Raja Ampat. Also, between Cape Kri and West Mansuar you have a diversity of things to discover that no other place – in the world I dare say – has to offer. The reefs around Kri are (I hope still) superb, and they boast loads of turtles, blacktip sharks, and all kinds of critters. Also some seagrass beds and sandy areas. Mantas are nearby as well, plus the best dive spots in the world (e.g. Blue Magic). There you will have also more chances to catch a ride to more remote places like Fam or so. Unfortunately, the crowds are there as well. I have dived around Birie island, and while I must say that the house reef of the dive resort there (which is the same reef that will extend to this homestay) is fantastic and a close second to Kri Eco’s house reef, I must also say that you will not have the variety of places for snorkelling to chose from that you will have around Kri. Anything inside the outermost islands is mostly muck diving rather than reef diving, meaning muddy bottoms and poor visibility, and less coral. If you stay there for more than 3 days, the house reef might become a bit boring. A big asset of Birie is the Wilson Bird of Paradise and another wonderful feature, that I will not name right now (you will discover it when you go there). The forests of Batanta are incredible, too! Currents can be very strong on the reef which doesn’t make snrokelling easier. Definitely a nice place to be, though. Many many thanks for such informative comments about the place. Knowing that Batanta is not the best location to expect for snorkeling or diving, I think I made the right decision to spend only 3 nights there and invest the rest of the schedule around Dampier strait for my about 13 days trip in R4. But I’m sure I will enjoy the place. You seems to know a lot about R4, so please don’t mind me asking another question. Right now, I book other two homestays on Gam, both provide diving tours, would you recommend me to book one on Kri as well? It is a very good idea to stay in several places. This way you spend some time on the water in the boat when you transfer from one homestay to the other, and usually that is quite interesting. If you’ve booked diving on Gam that’s fine. I would guess they go to the same places mostly as the ones on Kri. Hi everybody. I have 2 questions. I intend to go to Yenaduak in october. Coming from Sorong is it not easier to get a boat from there instead to cross to Waisai first? And as I am a single traveler, is the price p.p. the same (350’000)? Thank you for further information and for this really helpful webside. Sorry to take so long to approve and reply to your comment – it was trapped by our spam filter for some reason! Yenaduak is actually closer to Waisai than it is to Sorong and a ferry crossing of the Dampier Strait is a lot safer than doing it in a small boat, so Yenaduak don’t offer Sorong pickups. Yes – the price (unless it has been changed without advising us) is the same for single occupancy as for couples. Glad the website was helpful for you and all the best for your stay! How about the boat ride back to sorong? Is it a good idea, instead of going to Waisai under time pressure to get the ferry? My idea would be more of a day trip than only transport,following the coastline of batanta to sorong with some stops here and there if there is something interesting. I don’t understand why a 30km boat ride from the eastern edge of Batanta to Sorong should be more a problem than the 40km ride to waisai straight through the open sea? Are there different waves or why do most home stays offer the pick up in waisai? If you don’t mind the doubled price, and Yenaduak was prepared to include stopoffs along the way, then it could indeed be a better option than going via Waisai. The trip from Batanta to Waisai doesn’t go in a straight line through open sea, but arcs to takes advantage of shelter afforded by reefs and islands on the way. 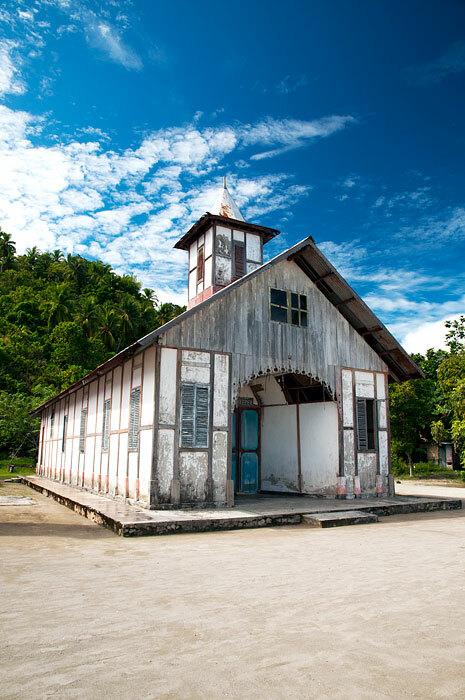 Most homestays only offer Waisai pickups because (i) Waisai is much closer to their location than Sorong is, and (ii) help is usually not far away in the event of boat trouble. We visited Yenaduak in November 2014 and had a fantastic time there. Samy and his family were great and always solicitous about our well-being. The bungalow is very spacious and has a private bathroom and toilet. It also has a large bed with mosquito net and is nicely equipped. We even had room service. Of all four bungalows we had on our trip to Raja Ampat, this was by far the best. The food was good, varied and more than plentiful. There were also fruits such as bananas, oranges and papaya. Clean water tea and coffee anyway . We encourage everybody to bring a hammock. 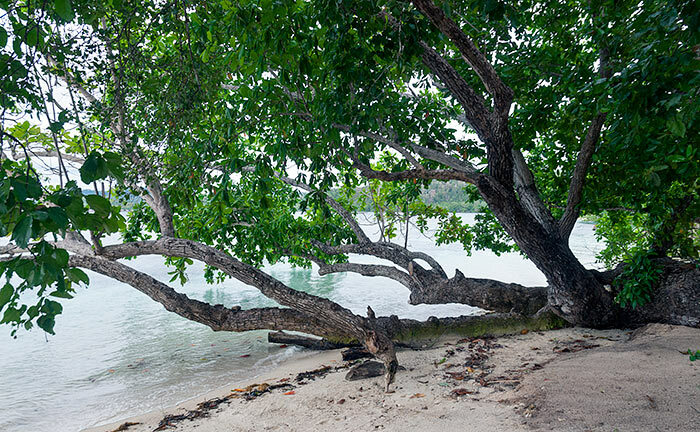 On the beach there are great old shade trees to hang them. Directly in front of the hut especially on the outer reef is a very good place for snorkelling. The corals are mostly in good condition and there is a lot of marine life to admire. In order to protect our budget, we have not made a snorkelling trip, although this would have been possible. The difficulty of booking transfer and accommodation is because Samy only speaks little English. His brother, who works in the resort across the bay speaks good English but is not always available. We tried to book from home by SMS in English and “Google Translation” in Bahasa. Unfortunately, with little success. We have then asked someone in Sorong to call Samy for reservation and transfer. This worked out fine. Be aware that if you arrive Waisai late in the afternoon and the weather is not so good you have to stay one night in Waisay. Usually in the morning conditions are good and transfer can be made. It is a one and a half hour boat ride (40 km) in a Longboat over the open sea. Anywa, we only can say it was well worth the effort!!!!!! !